Walt Disney Animation Studios announces the debut of the hit arcade-game-hopping adventure Wreck-It Ralph marking a Disney first with the early release of the HD Digital and HD Digital 3D on February 12, 2013, followed by the 4-Disc Blu-ray Combo Pack, 2-Disc Blu-ray Combo Pack, DVD, SD Digital and On-Demand release on March 5, 2013. From Walt Disney Animation Studios, Wreck-It Ralph takes viewers on a hilarious journey. For decades, Ralph (voice of John C. Reilly) has played the bad guy in his popular video game. In a bold move, he embarks on an action-packed adventure and sets out to prove to everyone that he is a true hero with a big heart. As he explores exciting new worlds, he teams up with some unlikely new friends including feisty misfit Vanellope von Schweetz (voice of Sarah Silverman). The film is directed by Emmy-winner Rich Moore. Featuring an all-star voice cast including Jack McBrayer as the voice of Fix It Felix, Jr. and Jane Lynch as the voice of Sgt. Calhoun, plus breakthrough bonus features that take viewers even deeper into the world of video games, Disney's Wreck-It Ralph has something for every player. Over an hour of all-new bonus material is featured on the Digital and Blu-ray Combo Pack, including deleted and alternate scenes, the theatrical short Paperman, plus much more. The home entertainment debut of Wreck-It Ralph will be available in multiple ways, containing exciting all-new bonus features that extend the fun-filled movie experience. Bit by Bit: Creating the Worlds of Wreck-It Ralph - Fans of the film will get a look at five new worlds created for Wreck-It Ralph. The short takes viewers into Game Central Station with the artists who brought Sugar Rush, Hero's Duty and Fix It Felix Jr. to life. - Alternate & Deleted Scenes - Four separate scenes are highlighted with an introduction and optional audio commentary from director Rich Moore. - Video Game Commercials - Viewers can check out the commercials created for the video games featured in the film - Fix It Felix Jr., Sugar Rush, Hero's Duty and Fix It Felix Hammer. - Paperman - This animated short film played in theaters before Wreck-It Ralph. It tells the story of a young man in an office who sees the girl of his dreams in a skyscraper window across the street. But how can he get her attention? 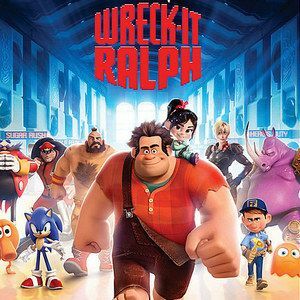 Disney Intermission: The Gamer's Guide to Wreck-It Ralph - When the film is paused, host Chris Hardwick appears on screen to guide viewers through a series of 10 video segments offering an inside look at the many video game references, Disney references and other hidden surprises featured in the film.